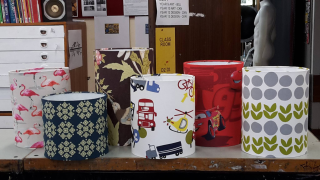 Liven up your living room or bedroom with your own A-frame or drum lampshade - get that professional finish, even if you have no previous sewing experience. Bring up to $40 cash to pay the tutor for the lampshade frame and other materials. You will also need to bring 1 metre of a firm fabric of your choice (a patterned fabric with a light background is effective in reflecting the light), a pair of fabric scissors, measuring tape, tailors' chalk and a 30cm ruler. [Please enrol at least one week before the course is due to run as supplies need to be ordered from outside Wellington].